Mr. Thambyah, the founder of 'Thambyah Madam. He had walked from Colombo to Kathirgamam to fulfill a vow. Photo taken in Kathirgamam shortly before his death in May of 1940. The late Appapillai Sinnathamby Thambyah was a leading businessman in Colombo, the center of commerce then. He was a pioneer printer and established his own Printing press "Meenambal Printing Press" named after his only child/daughter Meenambal. He was also a partner in several other leading businesses as well and owned several properties in Colombo. He was born in the year 1873 and died at 67 years of age in 1940.  Somewhere during this period, around 1925 or a few years earlier, when he was in the peak of his very successful business life, he had the spiritual urge to dedicate his balance life to the calling of God and the service of mankind. His only child and daughter, was married by then and she gave him seven grand children; five were born during his lifetime. He divided his business among his brothers, gave his properties in Colombo to his daughter and moved to Kathirkamam. He built the Madam, a solid brick and mortar structure, with iron pillars and supporting structures, and with a tin roof and loft. This was a large structure, with a big hallway large enough to accommodate hundreds of pilgrims who came to Kathirkamam place of worship dedicated to Lord Murugan. Kathirkamam at that time was a jungle shrine dedicated to Lord Murugan, which came to life during a specific period of the Hindu solar calendar with ceremonies lasting for less than two weeks in a year. During this period people of many faiths mainly Hindus, Buddhists, as well as Muslims would gather by the thousands. Devotes came to Kathirkamam for the festive season from all parts of Sri Lanka and also from India, Malaysia, Singapore, including those visiting their homeland from other foreign countries. Whilst Lord Murugan was of equal significance to the Hindus and Buddhists, Kathirkamam was of significance to the Muslims as well, because of a shrine of the Islamic faith there, and what was unique was that the three religions (Hinduism, Buddhism and Islam) blended together without religious borders. The madam the late Mr. Thambyah built was his first and only one and the third madam that existed in Kathirkamam at that time. He named his madam after his late mother Kathirammal, but with the passage of time it was more famously known as the Thambyah Madam. 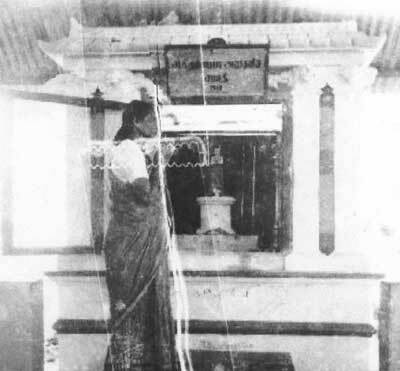 Our maternal grandmother praying at her father's samadhi, which was inside the madam. Our grandmother with children of people who worked at the Madam. We are told she tutored these children. Photo taken after 1960. There was only a jungle footpath from Tissamaharama to Kathirkamam and this pathway was thru thick elephant infested jungle. Transport was either by foot, in groups with safety in view, and by bullock carts, also in numbers. The distance was about ten plus miles by this only route and it took more than a day or two to reach your destination at the shrine, considering that the path was strewn with huge boulders over which one had to traverse by foot or by cart. It was not unusual for carts to overturn. The loud shouts of the chant "Haro Hara" kept the elephants at bay -- but not the hordes of monkeys! It was, therefore, a Herculean task for late Mr. Thambyah to build such a madam as he did. This having to transport the bricks, cement, iron girders, tin sheets, pipes, diesel motors, etc. through an almost impenetrable jungle and over boulders blocking at every turn on the pathway. But he did it. To his credit his was the only madam so solidly built whereas the two others at that time were of mud and cadjan (dry coconut) palm leaves for a roof. One notable feature of this madam was that he had rooms built to accomodate families who traveled with children. He had his own diesel motors supplying electricity and running water, and with hygiene and privacy in view he also built septic tank toilets, mainly for the ladies and young. The late Mr. Thambyah became so dedicated in the service of Lord Murugan that he took an active interest in the inhabitants of the tiny village surrounding the temple, and these inhabitants were Veddas (jungle dwellers) who though illiterate, were and are an important part of the story or mythology surrounding the jungle shrine of Lord Murugan. 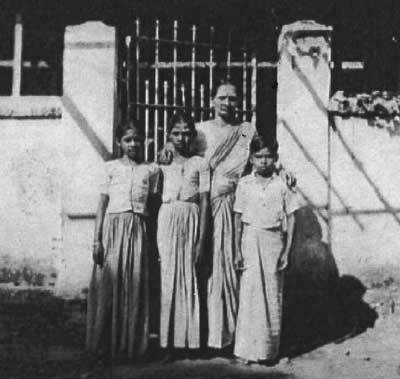 Mr. Thambyah built a school, provided postal services and acted as the post master both located in the madam which was mainly free and vacant during the off season. He became a respected elder of Kathirkamam. Being a small village and the religious affairs of which were administered by the Government Agent in Badulla, the late Mr. Thambyah was therefore a life line between the Administrators in Badulla, a good long distance away and the activities that went with Kathirkamam and the shrine. It is worth mentioning that pilgrims were fed twice a day. Food and accommodation were free. Donations of dry foods by rich devotees and businesses went into the big kitchen, where a battery of paid and volunteer cooks prepared meals to feed everyone who sat down for a meal. Both the very rich, rich and poor had to sit down together, all in a line, for a common all veggie meal. Of course, the first meal on the first day of the gathering/ceremony was by courtesy of the guest himself - the late Mr. Thambyah. There was always a special place for the late Mr. Thambyah who was always a honored guest of the Temple Chief Priest (Kapurala) himself, during ceremonial times, a distinction and privilege which was passed down to his family, after his demise in the 67th year of his blessed life, when he breathed his last in his daughters home, in the year of the Lord 1940. The Madam that was built is now long gone, bulldozed to the ground, using heavy equipment to bring a solid concrete building down to earth, just so to serve as a political means to the political masters of that time and for the votes that went with it! And thus, sad to say, a structure dedicated by one man to serve countless others, to give a tired pilgrim a free place to sleep and a hot meal, came crashing down, as did all other madams, and with that came down sanity itself! And the era of political hypocrisy was now born! May the soul of the late Mr. Appapillai Sinnathamby Thambyah Rest In Peace! "My name is Sivagurunathan Vimalan. I live in Toronto, Ontario, Canada. I was born in Colombo (Wellawatte) in July, 1960, and left Sri Lanka in August 1982. My maternal grandfather the late Mr. Arulumpalam from Kilivetti, grandmother Meenambal, the only daughter of late Mr. Thambyah of Alavetti/Manipay (Jaffna). My father late Mr. Dharmalingam Sivagurunathan of Kopay worked for the railways. Maternal great grandfather to my understanding was director of Colombo Commerical Co., Schewps, Ramsay Gardens, owned a lot of properties in Colombo (Rio/Nava cinemas). "From the time of my birth in year 1960 I have had the opportunity to go to Kadirgamam several times. These were happy times for both our families, my mother's and father's side inclusive. The 'Thambyah Madam' used to be run by my maternal grandmother from year 1940 until demolition in the 1970's. My mother's maternal grandfather Mr. Thambyah was founder of 'Thambyah Madam' (my mother was not born) built in year 1925. He ran the madam until his death in May of 1940. I have heard stories from family friends and relatives that my great grandfather was very much involved in the development of Kadirgamam. Elders living in Kadirgamam inclusive of Kapuralas will know my paternal grandmothter. Everyone called her 'Swami Amma', always stayed at the 'Tevayani Amman' temple madam when in Kadirgamam. She passed away in December 1974. When my great grandfather's samadi (was located inside the madam) was being demolished, a white-cobra had appeared - Veerakesari newspaper published an article about it. Great grandfather was a wealthy businessman too."